Check out this site. Although the site is not english but every post has an image so you know what you will be downloading. Not much themes for 3rd but some of the 2nd Ed themes are gr8. Lots of other games too. "Spyware for Symbian version 9 is now available signed and verified through the Symbian Signed process, according to anti-malware specialist F-Secure." Being a Symbian fan I really feel bad about this Signed spyware (if it is for real), because I thought that going through symbiansigned is really a tough procedure. Just Announced : New Technical Consultancy Service For All Forum Nokia Members. "The Forum Nokia Technical Consultancy service is designed to provide personal support for the entire duration of a mobile application development project. With highly-skilled technical engineers, the Technical Consultancy service provides personal and in-depth services that can be deployed at every phase of a project. The Technical Consultancy can add needed expertise to a project, identify potential problems and help avert them. Get your applications to market faster and easier than ever before. We'll also help you keep your project on schedule and on budget." "Wipro offers comprehensive mobile software-product-realization and consulting services to Forum Nokia community members. Wipro combines its technical, project management, and integration capabilities to help Forum Nokia members deliver products on time and within cost estimates." 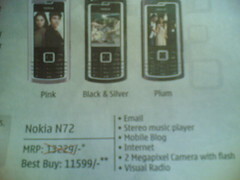 The wait is finally over with N76 and the 5700 ads coming out in newspapers. Many had been waiting for the N76. 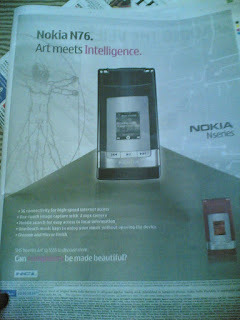 "1 motorazer kickass phone " - thats how my friend Kedar Parikh put it, and I agree. Originally uploaded by Avinash Rathod. Check out these E61i photos on flickr. Her screen name says it all e61isuperfan. Really cool pics. Check out that streetfighter game screenshot in one of the photos (download link in comments, surely going to get it for my E61;). I'm really impressed with the camera and the headset of the E61i. So I've changed my blog title. Earlier it was "Avi's Symbian blog". I am posting a lot of mobile stuff which aint Symbian. Thought it would be appropriate to change the blog title. I am a MyToday fan, have been using their FREE SMS service for quiet some time now. Every time I want to know which movie is in which theater in Mumbai I just have to point to mytoday on my mobile/PC. Not just Mumbai, information can be sought about most of the cities in India.Lots of good content like movie reviews, feeds, cricket live scores etc.. Check it out regularly as they come up with new features like free sms greetings which is now ON till 31st May. Browse nseries site on your mobile. Just go to www.nseries.com from your phones browser. Lots of info about products, competitions , tv commercials (ads). One problem , when any video link is clicked my browser crashed. Some rtsp related problem I believe. To view the site on PC browser click here. An event by RELIANCE that too developer centric, I can say just one thing "Dont miss it". 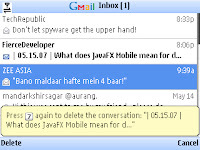 Mobile programming is hot in India, just have a look at the discussion forums of any development site, they've got hundreds of Indian programmers. While most of the developer events are stolen by Bangalore/Hyderabad this time we have a chance to attend such and event in aamchi Mumbai. Register today. The event is on 4th June 2007 5:30pm to 7:30pm. Inviting the mobile developer community for the June event of Mobile Monday Mumbai hosted by Reliance Communicatons. Visit this page for the agenda and the venue. British climber Rod Baber successfully makes the world’s highest mobile phone call on a Symbian smartphone, the MOTORIZR Z8, from the summit of Mount Everest. This is a some geeky stuff, but seems interesting. Its about video's and current video applications running on Symbian like Smartmovie, Realplayer , Coreplayer etc... which one's better. Then codecs and stuff , may be there is an audience who likes the article, here's the link. I like this application HourPower, check it out. Doesn't do much, just speaks out he current time at the press of a button. Its just what I wanted. You know the situation - you experience it almost every day: When you wake up in the morning, you'll want to know the time. Of course you could take a look at the alarm clock, but that would imply looking at the small clock on your bedside table. If you have a clock that's able to project the time on the ceiling, it's better - but still, you have to get your eyes into a state where they can focus at the numbers. This is where talking alarm clocks come in handy. But you might not have one. However, you do have a mobile phone. Why not let the phone read the time for you? Just add your blog to your Flickr account, get your 'upload to blog email id' and start moblogging with Jhalak/Shozu. 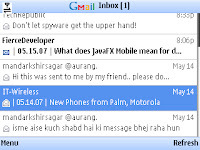 Jhalak is available only for S60 2nd Edition and for Indian residents only but its my favorite moblogging software. The previous post I made was after setting my blog entry in flickr. Once the flickr settings are done you get a upload to blog email id. Just create an album in Jhalak with this email id. Start clicking and sharing. And yes, you need a data plan activated from your operator. 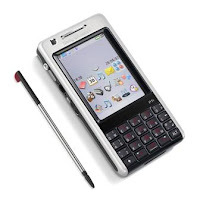 20 million Symbian smartphones shipped in Japan. Thats good enough reason for the Japanese to BooHoo the westerns. You even get to see the video of the westerns getting booed by them. A Boo is a type of ghost that appears in some of Nintendo's Mario video games. When Mario (or Luigi) looks toward this creature, it blushes, covers its face, and stops moving. When Mario turns away, the Boo becomes vicious and chases him. A larger boss version exists, known as "The Big Boo." Other types include "Fishin' Boo", who floats overhead dangling a lethal blue flame. Clock Screensaver is an S60 application by mBounce that displays two clocks with different time zones as a screensaver. So log into S60.com and get it. 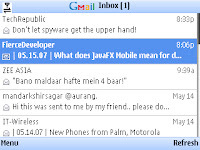 I found a bug in the GMail app for the E61. When I try to delete the a mail using the shortcut '7', the mail just below the selected one gets deleted. This is a pretty simple match the pair game. Try it out here, you could win the 5700. 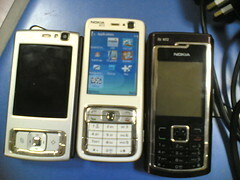 Two NSeries phones are in the making, the N81 and the N82. Check them out here. Not much difference between the two except for the form factor , N81 is slider and the other is a candybar. The 5700 XpressMusic and the E61i are now on Nokia India site, so expect them to be in the market soon. User agent switcher : At times you would like your PC browser to be reported as your phones browser to test something. I have used firefox as my E61 browser by changing the user agent string to "NokiaE61-1/3.0 (1.0610.04.04) SymbianOS/9.1 Series60/3.0 Profile/MIDP-2.0 Configuration/CLDC-1.1". You can google for your phones user agent. Will add more helpful extensions as I encounter them. This thought often comes across my mind "What is going to be the mobile os of the future". Will it be S60, Windows, Linux or will Apple come up with something. But here's a post that says something different and is really worth reading, followed it from emergic. 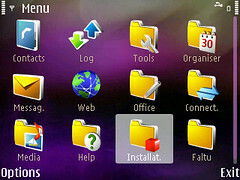 Do you have a wish for an application on your S60 phone or do you have an idea for an application. Well post your wishes and ideas over here may be there is some developer who will make it come true. Lots of wishes have already been posted and if there is an application that is already available that does what you want someone may post it there. Now why 2N95's, its like this. You got to register 2 people who will play the game , it's like hunting for clues throughout the city and performing some tasks. So the winning team gets N95 each and the $cash$. In India the promotion starts in July, but its been kicked off in Indonesia,Malasya,Singapore,Thailand,Philippines and Vietnam. 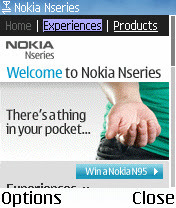 Contribute to the ForunNokia Wiki and you could stand a chance to win the N95. Check the link for more details.